Experience famous National Parks and unique towns on these USA vacations. 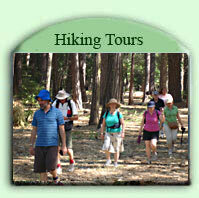 Comfortable adventure holidays, hotel based. 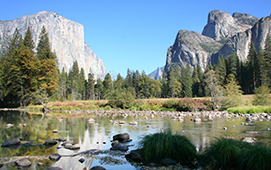 Explore the Western United States on one of our guided nature tours or let us assist you with a custom tour, from the Northwest and Southwest to the Grand Circle region. 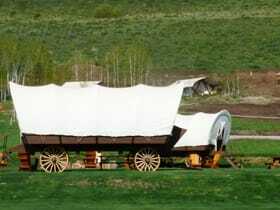 At Travel Dream West we provide personalized service, small group bus tours and -most importantly- unique, unforgettable experiences and insight into the American West. Why travel with us? 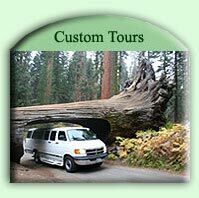 We are different: All our tours are lead by two professionals for optimal service and safety. Enjoy an active and diverse daily program full of interesting insights, travel with a maximum of 12 participants, explore and get to see unusual places off-the-beaten-track. Experience nature, culture and history of the West on these eco-friendly designed tours while exploring California, Oregon, Utah, Arizona, New Mexico and more. It's obvious that a whole lot of planning went into this trip. We saw many places that we would not have otherwise visited. The tour guide comments made the trip very educational as well so we came away with a greater knowledge of the history, geology and flora and fauna of the area. We especially appreciated your upbeat presentations and excellence. You have certainly done your homework with the wonderful variety of places we visited in the last three weeks. The staff on both vehicles, were all extremely courteous and friendly. Your knowledge of plants, animals and places, indicate how dedicated you are. Thanks to all your staff, we have had a wonderful holiday. Many thanks for a great trip – eight states in eighteen days – wow! We certainly covered to distances but also saw the many things off the beaten track. 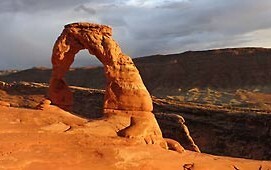 I particularly enjoyed Zion, the Navajo evening, Dove Fort, Salt Lake City, Jackson Hole and Badlands, bit it was all great. I hope to have the opportunity to travel with you again someday. All the best. This has been a wonderful trip – I’ve seen more of the Pacific Northwest than I could ever hope to. I will remember the beautiful sights and the wonderful people I travelled with, Cheers. Thank you so much. We have had a great time. Really loved the group. The variety of places, and experiences has been wonderful. You both have taken so much care of us and been flexible to the group needs. At Travel Dream West we offer you comfort in individual guided travel tours and pride ourselves in providing personalized service and memorable travel experiences. 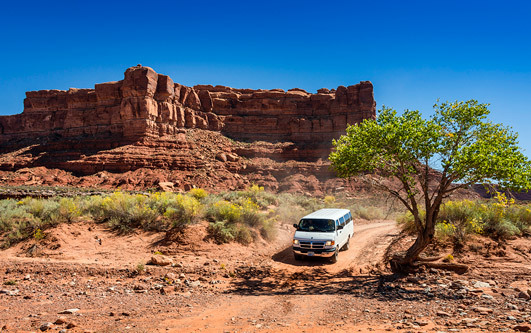 Twenty years of travel, research and exploration have resulted in these adventure tours – each a remarkable presentation of the best the West has to offer. Adventure Bus Tours – Relaxing, Comfortable Accommodations Our adventure travel tours are loaded with wonderful experiences during the day, and in the evening you can relax in hotels selected for their comfort and location. 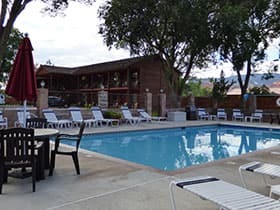 With emphasis placed on accommodations that cater to our small group travel style many of these hotels offer local charm and personalized atmosphere. 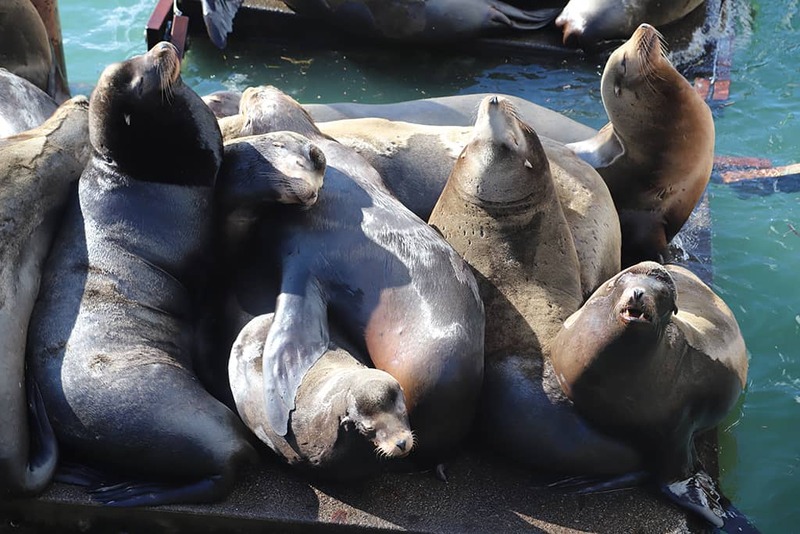 Custom group tours of the Western USA and Western Canada with itineraries based on traveler preferences, perfect for clubs, families and other small groups. Options range from variations on our standard itineraries to photography, hiking, wildlife, history, geology and other specialized interest schedules. Locals supporting locals – we select unique, locally owned hotels and restaurants whenever possible. We are based in Oregon and have personally visited and checked out the sights, activities and accommodations offered on our tours. Rugged, comfortable vehicles for off-the-beaten path exploration. Our Dodge and Ford Vans are suitable for less traveled roads that big buses can’t get to. Most are equipped with single seats that recline for comfort. A trailer for larger groups is available to carry luggage. Eco-conscious, we support the environment by following the “leave only footprints, take only pictures” mantra. Daily picnics with reusable dishes, a reusable water bottle gifted to every guest, conscientious hikes and respect for nature and Native cultures. 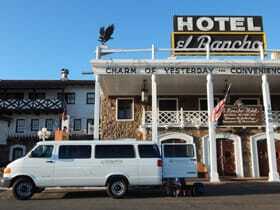 Whenever possible we utilize high-quality local accommodations instead of chain hotels. 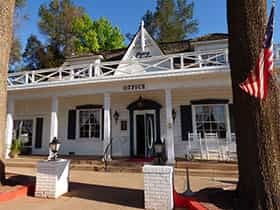 In some location we reserve historic or rustic lodging, including inns and cabins, that are clean and unique. Many hotels also include a wonderful continental breakfast for our guests. 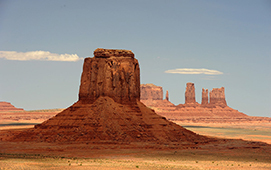 Custom Western USA tours can follow our existing itineraries, from exploring fabulous landscapes on our Western Wonderland Tour, covering Utah and Arizona, to spotting wildlife on our Wild West tour of Yellowstone National Park, Mt. Rushmore, the Black Hills and little known parks you might otherwise miss out on. We provide both guided tours for small groups and individual itinerary assistance for those who are looking for assistance in arranging their accommodations, car rental and route. 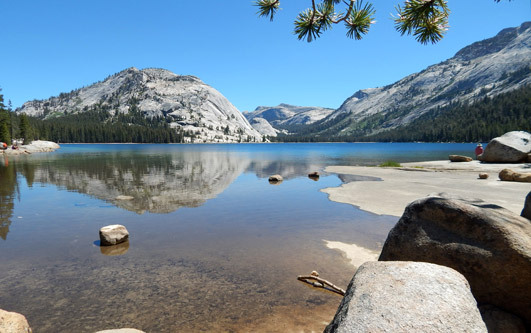 Sierra Nevada Trails Exploring California’s backcountry, mountain lakes, high deserts and volcanoes including Lassen National Park – more…. 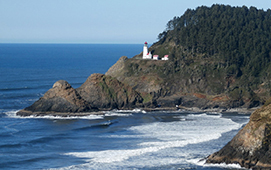 Oregon Nature Trails Guided travel and hiking tours through Oregon, discover the beauty of this little known state on this Oregon travel adventure – more…. 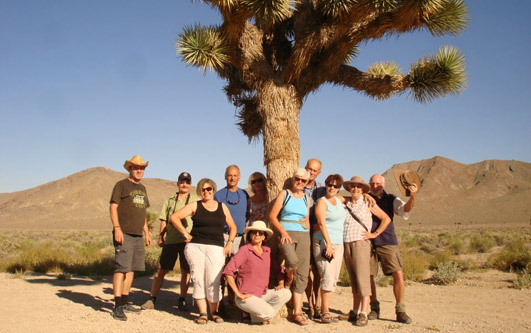 Discover the American deserts in Nevada and California on guided desert hiking and walking tours – more…. 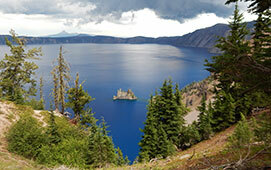 Experience Crater Lake National Park or the beautiful Pacific Coast on a small group bus tour while visiting Ashland. Ashland is home of the famous Shakespeare Festival. Ashland, located in southern Oregon, with deep blue, mystic Crater Lake, the deepest lake in the U.S. and nearby Redwood Jedediah Smith State Park with largest trees in the world. 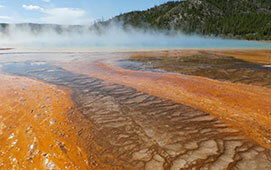 Emerge yourself in these natural wonders on one of our day tours from Ashland. From the lights of Las Vegas to the grandest of canyons, then on to the lovely California coast this is one tour that captures the essence of the west! 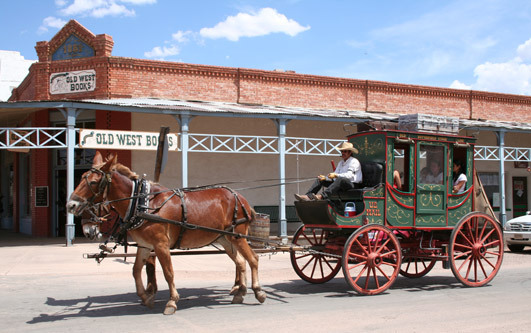 You’ve always wanted to see the “best of the west” and this whirlwind tour takes you to the heart of natural and cultural splendors. Revel in the silence as you watch the sunrise over the Grand Canyon then enjoy the quiet evenings in Moab, the gateway to Arches and Canyonlands National Park. Head through the desert of Death Valley and reach the beautiful coast for a refreshing contrast to the desert parks. 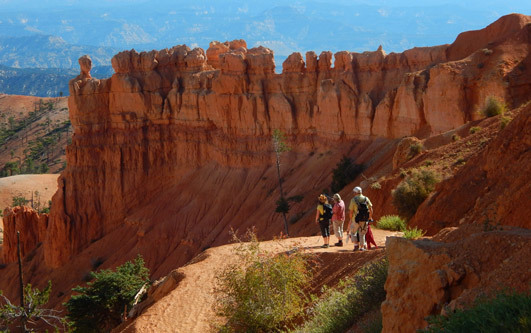 These outdoor adventure tours combine some of the west’s most magnificent scenery including the Grand Canyon, Monument Valley, Bryce Canyon, and Lake Powell. Let us show you what the big buses can’t- an adventure travel tour through the hidden valleys, the golden sunset over silent canyons, the natural beauty as you hike and drive through this unique geologic wonderland. Grand Circle travel for the individualist. Then excite your cultural senses in the city of Las Vegas. Experience the beauty of Wild West landscapes, towns and natural wonders on these adventure travel tours. 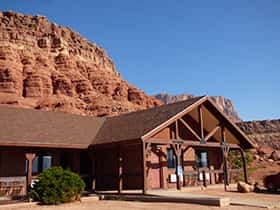 From San Francisco to Yosemite National Park, through the ghost towns of Nevada to the Teton mountain range and Yellowstone National Park, this tour ventures into the heart of Nevada, Utah and Wyoming. 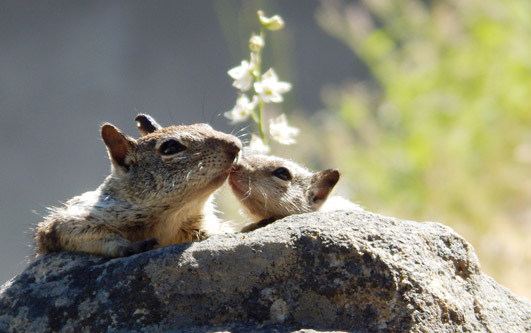 Spend time hiking, watching for wildlife, and photographing the culturally rich region. 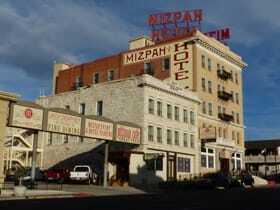 Small towns like Jackson, Wyoming and Tonopah, Nevada provide an authentic representation of small town life. 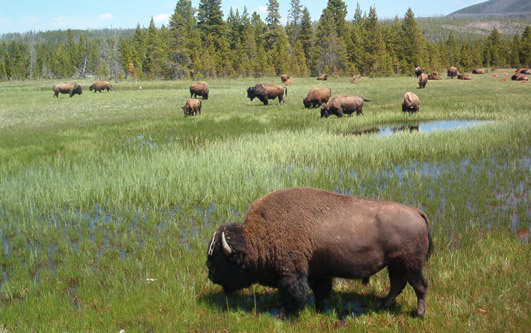 Discover wildlife and the history of the Wild West touring some of the most beautiful National Parks including Yellowstone and Badlands while exploring historical pioneer and Native American sites. This small group tour combines wildlife observations and visits to famous sites including Mount Rushmore, Crazy Horse Monument and the Black Hills in South Dakota. Get to know two beautiful capitol cities of the West: Denver, Colorado and Salt Lake City, Utah. 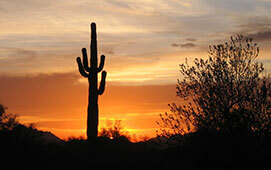 On our Arizona and New Mexico travel adventure you can expect a complete immersion into landscape and culture. 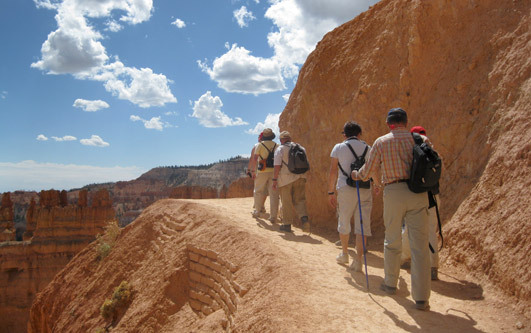 The Southwest’s outdoor adventure bus tour offers cactus forests, grand white sand dunes, petrified giant logs, volcanoes, and many unique and little known natural wonders. But nature isn’t the only thing that this region offers. Join this guided small group tour to explore the native cultures of the area, stroll the streets of artsy Santa Fe, and admire the setting of beautiful Sedona. 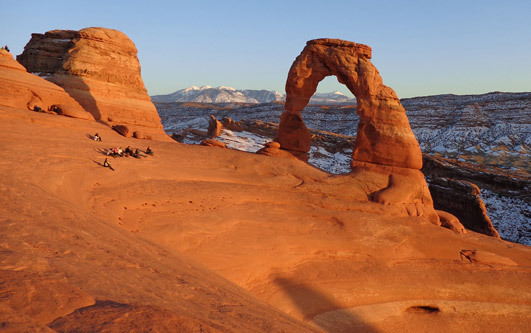 Participate at this unique outdoor adventure tour in the far west touching on some of the least known, most beautiful parts of this country. 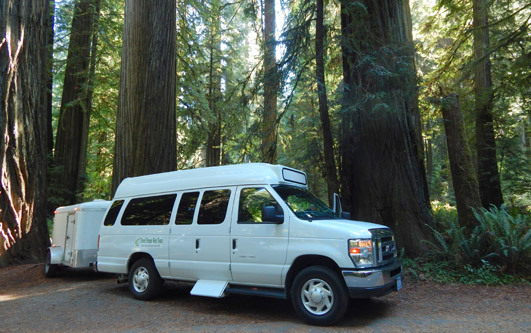 This tour combines Washington, northern California and Oregon travel. From the depths of Crater Lake to the expanses of golden sand beaches, from the Redwood tree giants to the Golden Gate Bridge you will be emerged in natural beauty. Little known, magnificent adventures await you on these escorted tours as you hike, explore and relax. 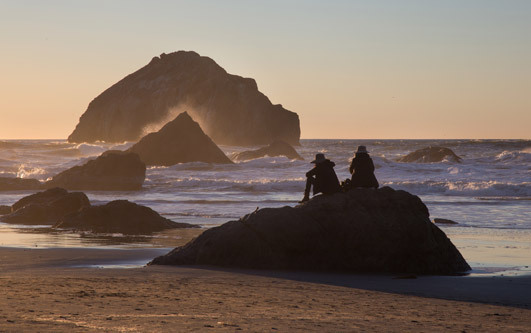 These Oregon Pacific Coast and volcanic Cascades tours offer a unique, personal view of the nature and culture found in Oregon. 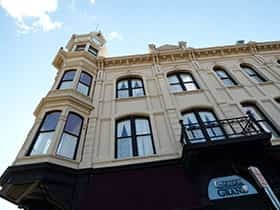 From an Oregon coast tours portion which includes the famous Oregon Coast Aquarium and quaint coastal towns like Newport and Bandon with their attractive shopping and gallery areas to Crater Lake National Park featuring the deepest lake in North America, the natural beauty of the State prevails on these tours. 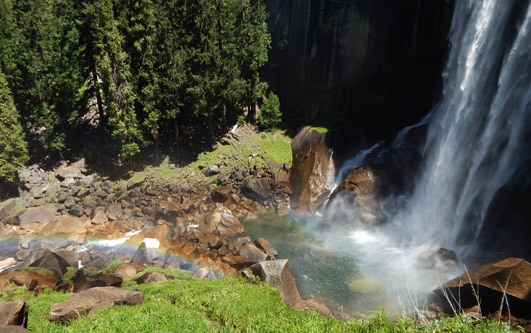 On these escorted small group tours you explore the highlights of “the Golden State”. 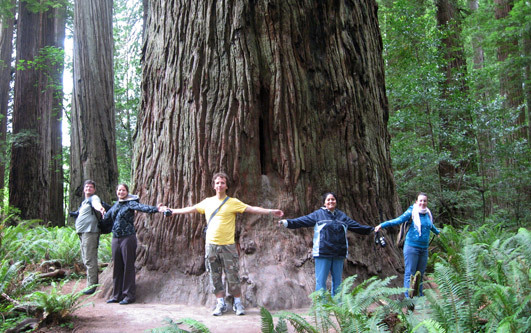 Whether you are interested in seeing the grand nature of Yosemite National Park, the vast expanse of Death Valley or the rugged coastline of Big Sur, the skyline of San Francisco or the less known, off-the-beaten path attractions that California offers, these escorted bus tours provide you with days of highlights explored in depth the small group adventure travel way! 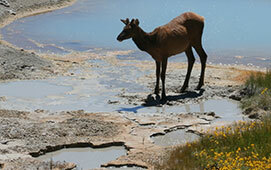 This springtime tour of California is timed with the blooming deserts, a paradise for photographers and nature lovers. 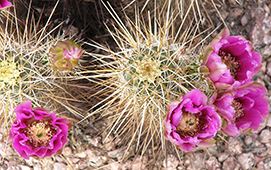 The harsh deserts of Mojave, Death Valley, and Joshua Tree National Park are transformed into brilliant fields of flowers, particularly after heavy winter rains. Hikes and off-the-beaten-path drives will take us into the heart of these desert landscapes. 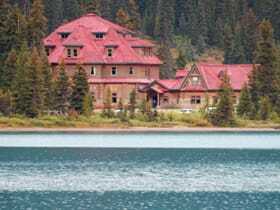 This trip offers more than desert- with stops at imposing Mt. Whitney, destination Las Vegas and Los Angeles, and a relaxing day in the lush Kern River Valley.